Almost everyone I knew from my elementary or middle school years grew up on Harry Potter, but while everyone else was busy dabbling in the world of Wizardry, I had my own special series of books that would become a pinnacle of my upbringing: Lemony Snicket’s A Series of Unfortunate Events. When I found a copy of the novel The Bad Beginning at my local school book fair, I decided to buy it and give it a read out of curiosity. It didn’t take long until I was unable to put the book down. I was so enthralled by the first book, I brought it to my mom and told her to read it because I loved it. She got about half way and gave up because she commented “She thought the book was too depressing.” Not too long later, a movie adaptation was announced, and my young self couldn’t be more excited. And the end result was….disappointing. Looking back, most people seem to appreciate the movie for what it is, a standalone experiment by Nickelodeon’s film department, but being so attached to the series growing up, all I could see were the flaws. That’s not to say the movie doesn’t get anything right, the atmosphere and cinematography superbly captured the melancholy tone the books were known for. In addition, we get a few good performances out of Emily Browning as Violet and Meryl Streep as Josephine Anwhistle. Little else, however, is truly great about the movie, instead coming off as little more than a quick buck to capitalize of a book series’ success, much like the Divergent films. 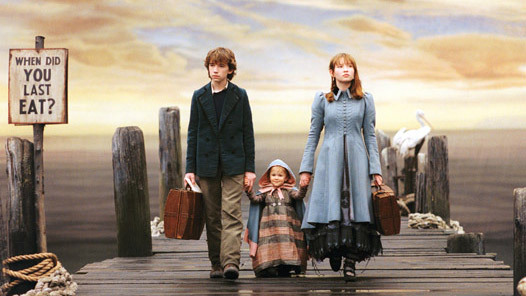 In fairness, The Series of Unfortunate Events movie isn’t nearly as bad, but it’s founded on the same sense of all flash, no substance that makes plenty of young adult films based off books forgettable. Here are some reasons why the film wasn’t able to capture the magical and melancholy essence of the books. The Jim Carrey performance is over-glorified. The character of Count Olaf is meant to be an eccentric, but intimidating, evil mastermind that continues to chase the Baudelaire children until their fortune is his. Jim Carrey may have seemed like a good idea back when his career was still in the limelight, but the end product is just Jim Carrey playing Jim Carrey dressed up as Count Olaf. There’s no denying that Carrey commands Olaf’s more eccentric comedic moments, but not once did he bring a sense of dread to the screen with the sinister mechanisms that make Olaf such a great and imposing character. Meshing three books together ruined the flow. It’s certainly possible to mesh an array of books together and still create a great cinematic adaptation. Scott Pilgrim Vs the World changed an excessive amount to fit six books into one feature film, but it still ended up being a great movie. However, some could argue the story does suffer because of it. This is exactly what happened with A Series of Unfortunate Events. It’s just a rush of novels criminally shortened to fit into an hour and a half, and it feels like a film puzzled together out of a mish-mash of ideas that never really work. It ends as though a sequel was never intended. Let’s be frank. Hollywood loves sequels, and most audiences end up hating a lot of them. But studios have begun to perfect the sequel in cinematic universes like Harry Potter or Marvel Studios, because they put a lot of talent behind them. This feature film, however, was never intended to be the next Harry Potter, but maybe it should have at least tried to shoot for that. With 13 books in the series, so many ideas and stories were explored through their pages. But here came along a Hollywood production company that didn’t really care to try to make it the best film it could be that would inspire at least another sequel or two, but just to capitalize off the books’ success and make an easy buck. This of course is the typical book enthusiast response when their favorite book is turned into a movie. We understand that a lot has to change when making a book into a film, but when you start changing the plot and confusing the same readers who paid to see this movie, that’s where it goes too far. As just one example, the entire ending is entirely all over the place. It takes blips of elements from A Bad Beginning and subsequently changes Violet into a damsel in distress, while Klaus has to save her from a forced marriage. In the book, Violet saves herself. It completely goes against Violet’s tinkering, intellectual brain and makes her into less of great leading lady than she deserves to be. After my mother and I watched the 2004 movie almost a decade ago, she commented that “She thought the movie was so much better, as it ended on a happier note.” And that alone made me realize how much this movie missed the point of the stories. The film’s story wasn’t captivating in its misfortune that befell on the Baudelaire children, the depressing, goth style was just a facade to attract young adult viewers. The film eventually just faded into obscurity, while the books continue to live on as great stories that anyone in any generation can pick up and read. How Hollywood has such trouble capturing the charm of such a beloved series is beyond me. Netflix is trying their hand at doing these stories justice in a television series, but only time will tell if the series lives up to the same level of greatness that makes these books such timeless reads. 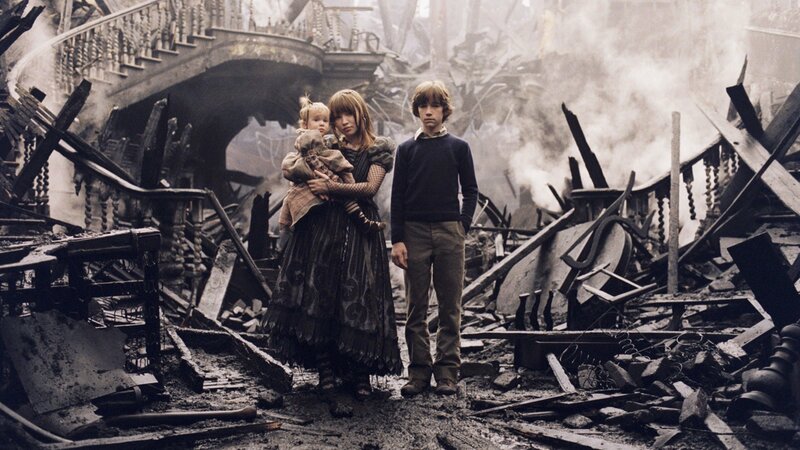 Lemony Snicket’s A Series of Unfortunate Events is set to premiere January 13th exclusively on Netflix. Be sure t let us know what you thought about the books, the 2004 film and the upcoming series! Next ArticleTV Review: Taboo Series Premiere - "Shovels & Keys"